I’m obsessed with this feature. I’ve already created over 50 Website Custom Audiences. My one disappointment when this feature started rolling out was that you couldn’t generate a Lookalike Audience from it. 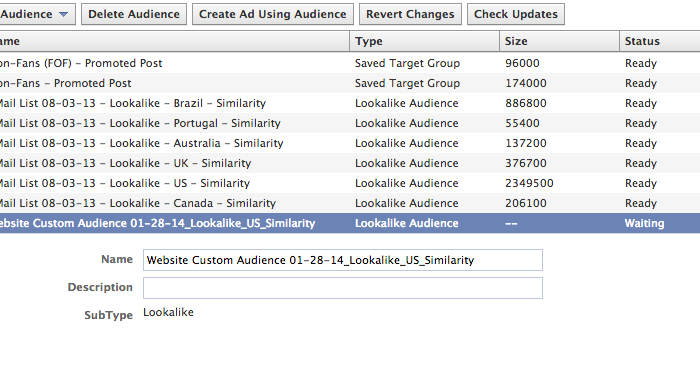 The Lookalike Audience is something that has been available within Power Editor for a while now. If you had created a Custom Audience and uploaded a customer email list, you could have then targeted users similar to your customer list by generating a Lookalike Audience. This process involves Facebook finding the top 1% (Optimized for Similarity) or 5% (Optimized for Reach) of users similar to those within your Custom Audience. Facebook isn’t clear on how this is done, but we can assume it involves comparing demographics and interests. This is great for anyone with smaller audiences. Instead of relying entirely on an audience of 3,000 people, for example, Facebook may turn that into 500,000 or even 3 Million people. 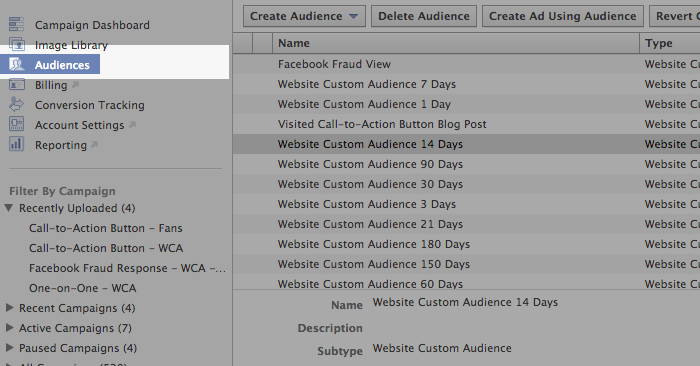 Within Power Editor, click on Audiences at the top left to view all of your current Custom Audiences and Saved Audiences. Highlight your Website Custom Audience. 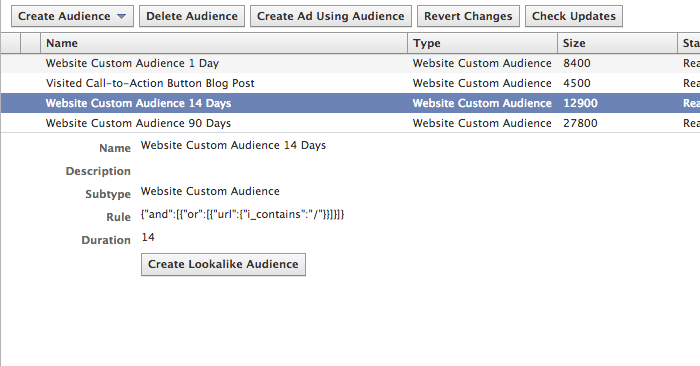 Then click the “Create Lookalike Audience” button. You can only create one audience per country at a time. You can, of course, create multiple audiences, one for each of your main targeted countries. While optimizing for similarity will certainly result in the more relevant audience, I tend to create both and test to see what is most effective. 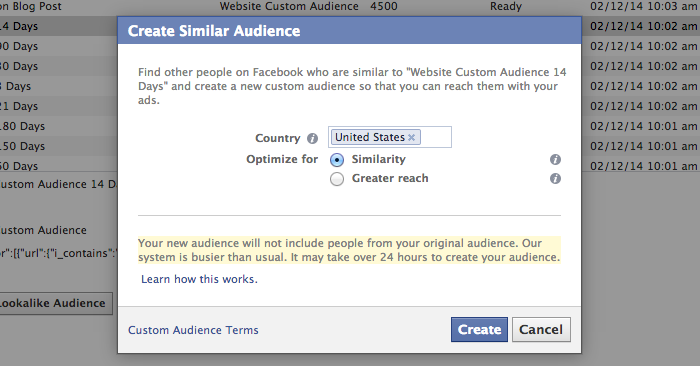 Note that it can take up to (and sometimes longer than) 24 hours for Facebook to generate this Lookalike Audience. The status will appear as “waiting” while it is generating. 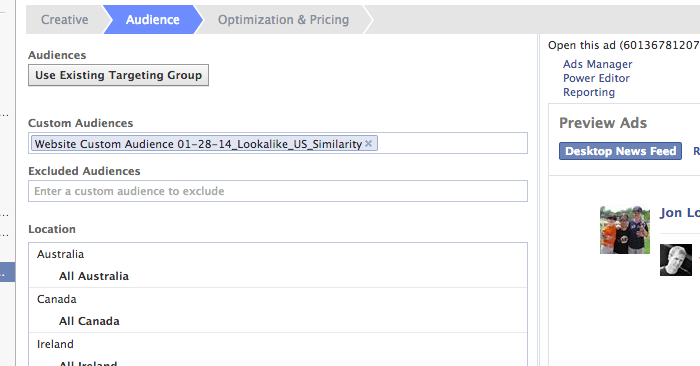 Once you’ve created your Lookalike Audience, you can target it within an ad. From the Audience step of ad creation, simply start typing the name of your Lookalike Audience in the Custom Audience text box. You can list several Custom or Lookalike Audiences here. You can also choose to exclude them. Note that if you have several that you will often use, it may be best to create a Saved Audience to make this step easier. 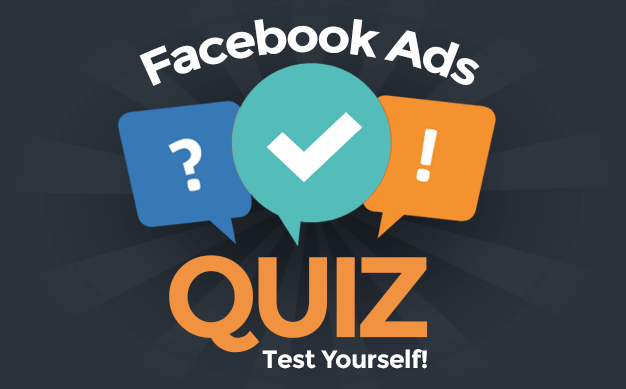 Your priority with creating Facebook ads should be on targeting your most relevant audience. That starts first with targeting your fans, email list and website visitors. Targeting your email list and website visitors is also a great way to increase your fan base by reaching those who are on that list, but aren’t fans. However, what if you want to expand the net a little bit and still reach a relevant audience? That’s where Lookalike Audiences come into play. Of course, you could also try targeting these groups when you have other goals, like driving traffic, sales and other conversions. While I tend to focus on my fans for conversions, I’ll often target non-fans when promoting especially popular pieces of content. This would be another group to target in those cases. 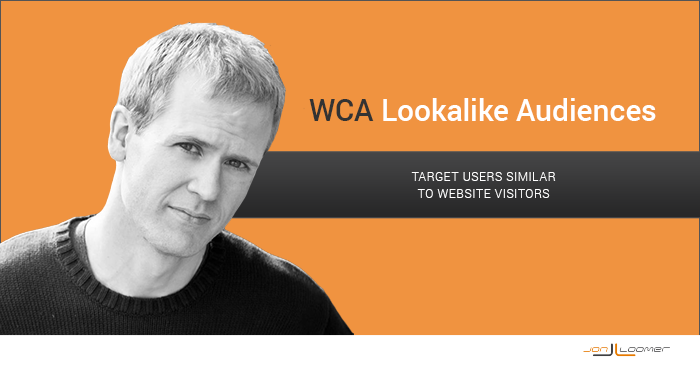 How are you looking to use Lookalike Audiences for WCA? Let me know in the comments below!